Unbelievably beautiful 4 bedroom condo perched on the front corner of El Faro complex! Wraparound terrace with delightful Caribbean views! Private terrace with jacuzzi whirlpool off bedroom. Impeccably Decorated. Luxury beachfront and poolside 3 bedroom (2 king suites and 1 queen suite) and 2 bathroom condominium with ocean views from the living room, kitchen and master bedroom at Luna Encantada. ... up to 15% off all year, call for details! Restrictions may apply. Top floor condo in El Faro complex. Bathtub in master suite & rain showers in both baths. Private terrace overlooking infinity pool & beach. Gigantic rooftop terrace, 1st in the complex w/ best view, bar, dining area, bathroom & more! 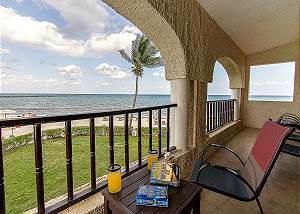 Luxurious beachfront condo w private terrace off living rm /master bdrm. Additional spacious rooftop terrace, bathroom, bar area, dining & sun deck area. Beautifully furnished in classic style. Top floor of El Faro. 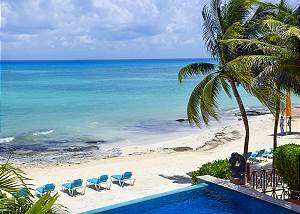 Beautiful beachfront condo, 3 bedroom, 2 bathroom. Beautifully tiled, decorated and furnished. Impressive kitchen with bar area for 3, dining at unique tree stump table for 4 - New Year's Eve still available! Best rate!! Gorgeous beachfront condo with incredible views from the moment you walk in the door. Beautifully decorated and well laid out; luxuriously accommodates 6 to 8 people! Private beach view terrace with the sea lapping a few feet away. Private grill. Spacious oceanfront luxury condo. 10-ft ceilings throughout. Private terrace with ocean views. Master bedroom features walking closet, connecting bathroom and terrace access. Dining for 6, bar area for 3. Modern condo with corner views of the ocean. Ground level, poolside walkout. Master bedroom ocean view with private terrace. Sunken living room. Bar area for 3, dining for 6. 3 bedroom, 2 bathroom. This premium vacation condo is located on the second floor at the end of the hall, closest to the beach. You’ll love the panoramic views of the ocean!